Left: Anti-kickback bits have a body shaped to limit bite. Setoiv: A radial grind on the backside of the carbide leaves more mass behind the cutting edge to support the tip. It also prevents shrinkage in bit diameter when resharpening. Bit tip affects plunge cutting. The extra cutting tooth in the center of the bit at left helps smooth the bottom and clear chips although overall cut quality will be about the same for all three bits. On core-box bits, look for a cleanly ground point on the bottom tip of the bit. Bits with steeper angles plunge easier, leaving a cleaner cut. On plunge cuts, bits must move chips fast to prevent burning. When talking about router bit performance, there's a tendency to consider just the bit. However, the bit is only part of the total picture. The kind of material you are working, the depth and width of the cut, the condition of the bit, and the speed that you move the router along the work (or feed the work past the bit) also make considerable differences. This bit has a dust shield and a relief grind under the bearing. With a relief grind, you can switch to a smaller bearing and use this cutting surface. Less expensive bits may not have any relief grind. dull faster, and almost always produces poor cuts. Keep your bits clean of pitch and sawdust with a good pitch and gum cleaner. Lubricate the bearing frequently. If you have the skill, you may want to hone the cutting edges of HSS bits after use to maintain a sharp cutting edge as long as possible. But don't even try to sharpen carbide bits—leave that task to a skilled professional sharpener. Here's how to get more mileage (and longer life) from your router bits. 1 Never overload or abuse a bit. If the job calls for cutting away more than the equivalent of a 1A" square area, make multiple passes with light cuts. Consider a square as the upside limit for most cuts. 2 For lots of heavy duty routing, use 'A" shank bits if your router accepts them. They're stronger, stiffer, deflect less, and easier to regrind. 3 Use bits with the shortest cutting-edge and the largest cutting diameter that you have. When possible, select bits with high hook angles and large gullets for fast chip ejection—they will run cooler and stay sharp longer. 4 Use sharp bits. If you're burning wood, having to apply more than the usual feed force, or getting chattering while cutting, suspect a dull bit. 5 A router of 1 Vi hp. or more will cut at faster feed rate and at the same time won't heat up the bit as fast as a router with less power. 6 When mounting a bit, insert the shank into the collet and finger-tighten the lock nut. Twist the bit several turns to let it seat itself. Then, lock the bit with %" to Vt" of the shank captured in the collet. Do not insert the shank all the way to the bottom of the collet. 7 Set router speed to spin the bit at its optimum rpm. Bits over 1" in diameter should be slowed to cut satisfactorily and not overheat. 8 Use a two-cutter system. Do most of the rough cutting with one bit, then make the final cut with a new or freshly ground bit with low mileage. 9 Look for uneven cuts caused by extensive wear on a portion of the bit. This defect could produce poorly fitted joints. Sharpen or replace the offending bit. Buy the highest quality bits you can afford. Clean and lightly oil bits after use. Sand the shanks smooth with emery cloth. Clean and check the collet frequently for wear. Lubricate the ball bearings after each use. Store bits so cutting edges and bearings do not get damaged. diameter bit spinning at the same rpm will hit 164 mph. Some experts suggest that a 130 to 140 mph tip speed should be the maximum for optimum performance and operator safety. Look at almost any furniture piece and you'll find examples of decorative treatments you can reproduce with your own router. Demand created by the popularity of portable routers has resulted in a nearly limitless variety of bits being made available. The bits pictured on the next two pages represent some of the basic styles that woodworkers find useful. Edge-forming bits cut decorative profiles along the edge of the workpiece or cut one or both parts of an interlocking joint. Most have a pilot bearing on the end of the shank to ride along the edge of the workpiece to control cut width. Field or surface-cutting bits have side and bottom cutting edges so they can cut into the surface of the workpiece and then be moved horizontally. They do not have a guide bearing so some type of guide— straightedge, edge guide, or template guide bushing—must be used to keep the router moving straight or accurate. The cuts may be decorative or functional. 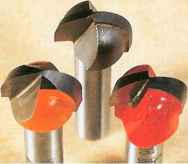 Specialty bits, as the name implies, encompasses a large category of bits designed for unique routing tasks, either decorative or functional. The multi-profile bit, for example, has many different cutting edges. By changing its height in relation to the workpiece, you can cut an almost endless number of different profiles with it. A lock-miter bit, on the other hand, cuts a specific miter profile that's ideal for joining workpieces. If you plan to work with plywood, you need to know about plywood bits. Plywood often is manufactured undersized, or thinner than nominal size. Put V2" plywood into a W dado and you'll get a poor fit. 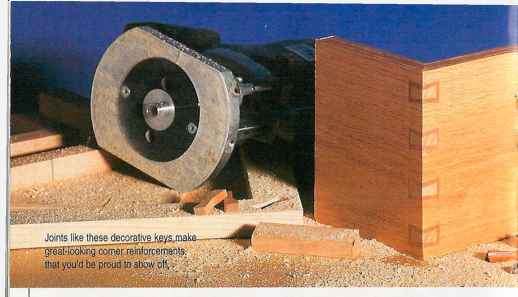 To help, some router bit manufacturers make undersized bits (7/32", %", u/32", and %") to accommodate the thinner plywood. With your first router you won't need specific bits right off, but consider buying these for starters (sizes refer to the dia-mater of the bit's bite): W, -Vs", and Vi straight bits; ]A", Vs", and Vi" round-overs; 3/i«", 5/i6" and '/¡"cove; Va" radius and 5/32" radius roman ogee; W and ^'beading; and a Vs" rabbeting bit with bearings. To expand the list, add several spiral bits, a 45° chamfer bit, a 14°-'/2" dovetail bit, a XA" round-nose bit, a 'A" mortising bit, and a 90°-^" V-grooving bit. 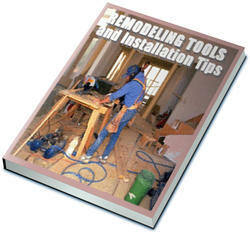 This collection will enable you to make a wide variety of routing cuts. Many companies offer sets of bits at substantial savings compared to what you'd pay if buying them individually. However, mentally subtract the bits you aren't likely to use and then calculate the costs of those remaining to determine if the set remains a good buy.